Our bodies react to seasonal changes, like trees, like nature, like the blooming flowers. Spring is the season of waking up, new beginning and transformation. The following 3 rituals will help you welcome the spring with up uplifted energy and radiance. Spring is the perfect time to start something new and let go of the old. Think of habits, behaviors or patterns that no longer bring you joy and health. What will you replace them with? Perhaps you need to exercise your body in a new way, take a new class or join a new exercise group. Maybe you need to change your wardrobe and wear things that reflect who you are now and not who you have been. Renew your spirit by learning something new, a language, a craft, a musical instrument. What can you do to bring in newness and freshness into your daily routines? Take some time to write a very detailed description of ‘healthy you’. If you were at your healthiest, what would you and your life look like? What will you be doing? Where will you be living? How will you spend your day? What will you be eating? Who will you be with? What will you look like? How will you be feeling? Create a very vivid picture of ‘healthy you’ with your words. Imagine it, see it, feel it, make it alive and vibrant. Why wait? Start living as ‘healthy you’ right now! The spring is an excellent time to let go of heaviness, fatigue and toxins by healing and nourishing your digestion and cleansing your organs. For a few days avoid foods that are hard to digest and remove foods that are highly processed and refined. Focus on eating lots of produce, whole grains, legumes and drinking a lot of water. Health starts in your digestive system and by allowing it to gently cleanse you will be flowing it with health and vitality, you will be revitalizing every cell in your body. Wishing you a happy and healthy spring. Today I would like the spring energy minus the major-league pollen. Ouch. The Seasons have forgotten about Spring in New Delhi, Rachel. We seem to have jumped right from a harsh winter to a hot summer-ish weather. I’m still sticking to plan by eating seasonal fruits and staying hydrated though. YES! Let go of that heaviness. Spring is the time to wake up a little earlier, move your body a little more, start incorporating lighter, fresher foods into the diet, and reestablish a gratitude practice that may have diminished over the cold winter. Love the idea of envisioning a healthy you. That’s so powerful! 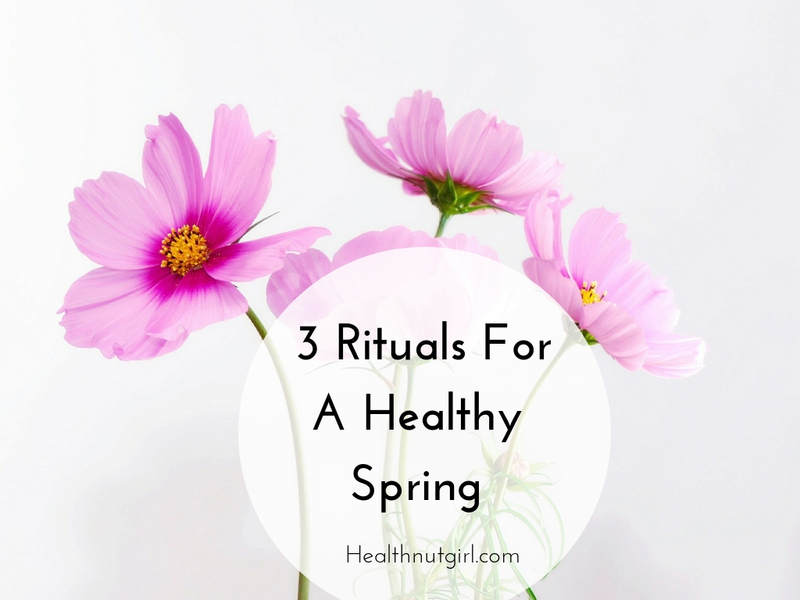 Thank you for sharing your three rituals for health Rachel. Spring has sprung and it’s divine! 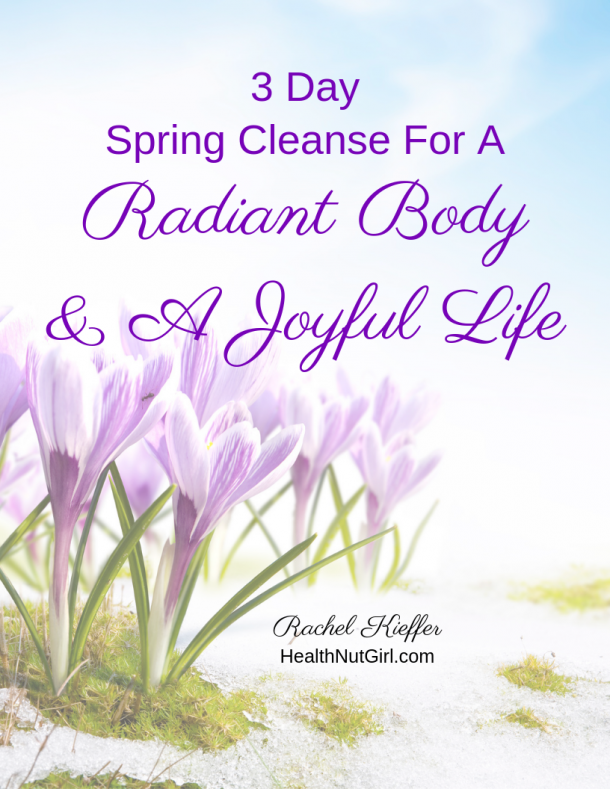 I love these wonderful spring rituals Rachel! I am inspired to envision my vibrantly healthy me each and every day! Thank you so much!